Ragnar Klavan may be a centre-back by trade, but Dominic Solanke was in no doubt his teammate would be able to pick him out with a pinpoint cross for Liverpool’s third goal in Dublin on Saturday night. 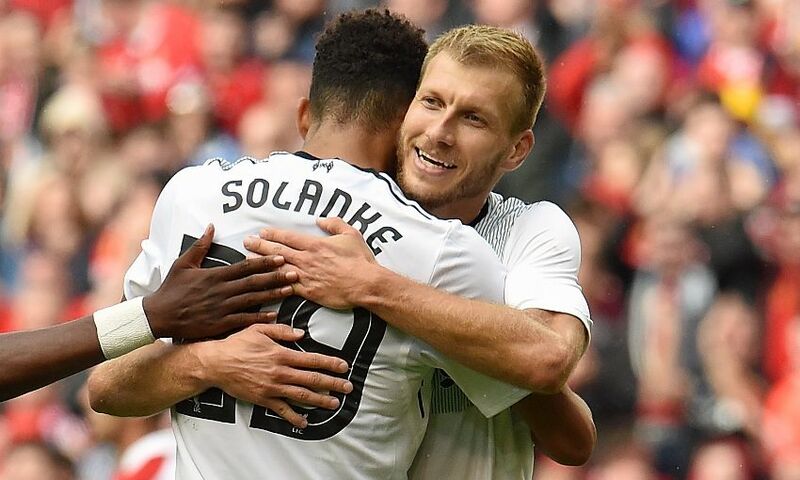 With time ticking away at the Aviva Stadium, Klavan arched in a centre from the left in the direction of the forward, who had pointed to where he wanted it and duly did the rest by planting a header into the back of the net to secure the Reds’ 3-1 win over Athletic Club. And while the assist may go down as something of a collector’s item, Solanke insists he wasn’t in the slightest bit surprised by the quality of the delivery. “I know he’s got good delivery and he can see a pass,” the summer signing explained. “I had a little gap between the two defenders. “I knew if [the cross] would go over the first one I would be first to it and he did exactly that, so I thank him for that. The effort was Solanke’s third goal for Liverpool since he joined the club back in July, adding to strikes against Crystal Palace and Hertha BSC. The 19-year-old acknowledges he feels as though he’s settled swiftly into his new surroundings, aided by the support of his teammates and Reds fans, who have been out in force at each of Jürgen Klopp’s side’s eight friendlies. “It has been amazing and I’ve settled in with the boys quite quickly and they all made me welcome straight away,” explained Solanke. “To get away [on tour] meant there has been a lot of different experiences, so that has helped me. “[The fans’ support] is crazy – it was overwhelming really when you saw all of the fans in Hong Kong, Germany and then here [Dublin] and you just see red shirts everywhere. Liverpool’s win over Athletic Club wrapped up their pre-season schedule and attentions now turn to next weekend’s Premier League opener with Watford at Vicarage Road.